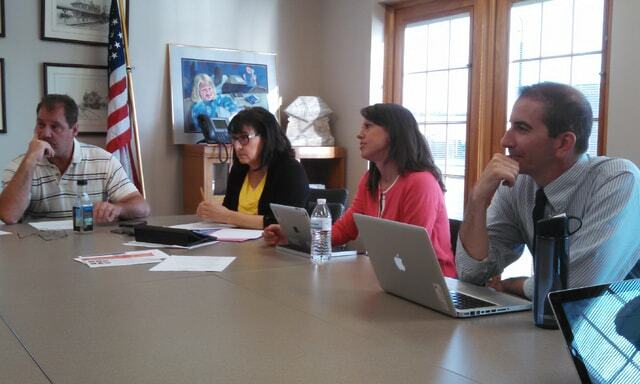 The Galion school board approved a contract with the teachers’ union Thursday morning. Pictured from left to right: Board member Bob Zeisler, Treasurer Charlene Parkinson, Board President Jennifer Kuns and Superintendent Mark Stefanik. GEA membership had voted to accept the tentative agreement on Wednesday. A resolution for a tax levy renewal was also approved. The county auditor certified that the five-year renewal would generate $1.2 million per year for the district’s operating expenses. “We are not asking for new money and this is much needed,” Kuns commented. The district will file in August to put the renewal issue on the November ballot. The board also approved a two-year administrative contract with Kyle Baughn as Assistant High School Principal/Athletic Director, effective July 1. He was previously employed at the district as a Middle School math teacher. A supplemental contract with Baughn, not to exceed 20 days, was also approved to cover some work before his contract begins, primarily conducting coach interviews. Colby Bright was approved as head basketball coach. Baughn, who attended the meeting, said they are currently interviewing for a girls basketball coach and a softball coach. A contract with SC Strategic Solutions was approved. The company will scan all hard copies of student records into an electronic format. Treasurer Charlene Parkinson explained that the district currently stores records in the basement, which makes them vulnerable to damage. She noted that the electronic system will make locating documents much easier and they will be able to redact sensitive information. There are an estimated 650,000 pages of student records alone. Strategic Solutions will charge the district 8 cents per copy, totaling $52,000. It will also store the data off-site. The Galion school board’s next regular meeting is June 16 at 6:30 p.m.